Your Internet Source for Security Products !!! The SPDA-500 Drive-Alert Driveway Alarm System is the security industry's most-often used method for detecting a vehicle when it enters a driveway. A variety of features and options make this unit ideal for both residential and commercial applications. The Drive-Alert allows homeowners to know when someone enters their driveway. The out-of-sight sensor detects moving objects in a nominal range of eight feet on either side of the sensor – and sends a signal to the master control unit, which sounds an electronic whistle. The sensor, when placed alongside a stationary metal object (such as campers, farm tractors, RVs, boats, or gasoline tanks) will detect any movement of that object and sound an alarm, aiding the prevention of theft and vandalism. Restaurants, banks, pharmacies and other businesses that utilize drive-up windows can use the Drive-Alert unit to signal a customer’s arrival. Industrial safety is improved by using the Drive-Alert unit at busy or blind intersections, helping to prevent accidents by signaling the movement of vehicular traffic in these areas. The SPDA-500 Drive Alert is mounted easily in any enclosed area with 120 VAC access. The sensor is buried 6" deep, parallel to the drive or area being protected. By a simple adjustment at the control box, the sensitivity of the sensor’s operating range, and the length of time the electronic whistle sounds, can be changed. The New SPDA-503 Drive-Alert Driveway Alarm system provides the same dependable method of vehicle detection as the SPDA-500. However, the DA-503 incorporates built-in X-10 transmitters that use a home's existing electrical wiring to transmit a signal which sounds chimes when a vehicle enters a driveway, or wherever a sensor has been buried. The once difficult and expensive task of hard wiring security sound into rooms and remote areas no longer exists. The SPDA-503 can be ordered as a complete unit which includes a control panel, 1 DA-058 Remote Chime, and 1 sensor with 100 feet of cable. Any number of chimes may be used and longer lengths of cable are available. The Drive-Alert is a multi-purpose, solid-state electronic alarm system designed to detect vehicle traffic in driveways, farm lanes, intersections, and any areas where knowledge of vehicle movement is desired. The out-of-sight sensor detects moving metal objects in a nominal range of eight feet on either side of the sensor — and sends a signal to the master control unit, which sounds the chime. The New SPDA-504 Drive-Alert Driveway Alarm system provides the same dependable method of vehicle detection as the DA-500. However, the DA-504 incorporates built-in X-10 transmitters that use a home's existing electrical wiring to transmit a signal which sounds chimes and turns on lights when a vehicle enters a driveway, or wherever a sensor has been buried. The once difficult and expensive task of hard wiring security sound into rooms and remote areas no longer exists. This model uses the same method of sounding a chime as the DA-503. Additionally, the DA-504 uses two methods of turning on lights; the DA-060 Lamp Module which any lamp can be plugged into, or the DA-059 Wall Switch which functions as a standard on/off switch AND receives an alarm signal which triggers the lights to turn on for a chosen period of time. The DA-504 can be ordered as a complete unit which includes a control panel, 1 chime, 1 lamp module OR wall-switch, and 1 sensor with 100 feet of cable. Any number of chimes, lamp modules, or wall switches may be used, and longer lengths of cable are available. See our accessories section for details. This Drive Way Notification System Features a wireless chime for indoor and outdoor applications. Its wireless PIR detector is made for indoor or outdoor use as well and has a detection patterns for doorways or driveway coverage. then plug-in the chime box receiver to complete the installation. Features include On-Off control, adjustable volume, individual enunciation of up to three zones, an optional alarm mode, and a 1 amp form C relay. This is the Next Generation of Wireless Notification Systems Designed for Perimeter Protection! Your Home or Business Deserves the best advanced wireless technology in the form of a greater RF transmission range than found in other products. Make your life more comfortable and convenient knowing some one entered your drive way. 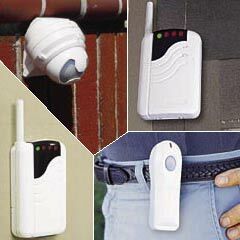 Wireless Notification System is the ideal choice for perimeter awareness and wireless remote control. 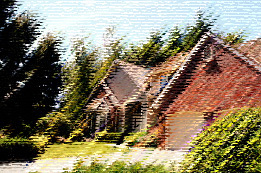 The WNS monitors your property 24 hours a day to detect approaching vehicles and people, giving you time to prepare. The WNS serves as a welcome chime or perimeter alert for your home or business or any drive up application, like fast food, pharmacies etc . The WNS works as a convenient wireless switch for activating a variety of electric equipment (e.g. door strikes / magnetic locks, lights, sirens, motors). Detection pattern adjusts easily for perfect aiming. can be clipped to a belt, worn as a pendant, or mounted to a wall. Low battery indication by tone tells you when to replace batteries and prevents malfunctions.